Hydra: A very interesting predator that is one of the few freshwater cnidarians—stinging, celled animals that include sea anemones, corals, and jellyfishes. A killer enters your aquarium, quietly. You don’t even hear a pin hitting the floor when it enters. It slowly starts spreading in your tank, many times it goes unnoticed. Then, it starts eating your baby brine shrimp. Then it’s discovered picking off your shrimplets and tiny fish fry. No, it’s not an aquarium thriller story, but a story ripped from reality. We are talking about Hydra—unwanted and uninvited guests (or pests) in your aquarium which are hard to eradicate and keep coming back every time you think you have finally gotten rid of them. Hydra can be an aquarist’s nightmare. They can be a problem for every freshwater hobbyist, not just the ones who breed fishes or shrimps but also those who just keep fish or plants. What are Hydra? Hydra is genus of a small, predatory animals from the phylum Cnidaria (corals, sea anemones, sea jellies, etc.) that includes about 25 species. They exist as soft-bodied polyps with tentacles that can ensnare, sting, and kill small prey animals they pluck out of the water column. In this photo it is evident that a hydra can have as many as three to five buds at the same time. They can literally cover the glass surfaces in a matter of a couple of days. Hydra can be about a centimeter long and have four to twelve tentacles. The base of a hydra, which is called a basal disk, secretes an adhesive substance that keeps the individuals attached to the various substrates, such as the aquarium’s glass walls, plants, and wood (I wish I could get that glue to stick moss and Bucephalandra to wood!). Depending on the species, their tentacles can be as short as a few millimeters or longer than 25 mm. In my tanks, I usually see individuals of two distinct species. One is green and has smaller tentacles, while the other is brown and has longer tentacles. Based on the information I’ve found, the green ones are likely Hydra viridis. Individuals of H. viridis look green because of the Chlorella algae they contain. These algae stay in its body and establish a symbiotic relationship through repeated consumption of the individual symbionts by the individual hydra. The hydra keeps these algae safe and helps them spread from one place to other. 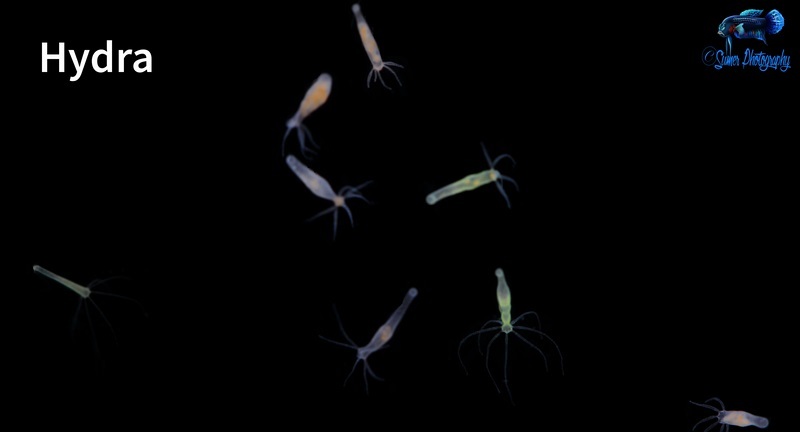 In return, the algae make their own food through photosynthesis, and the hydra benefit from some of that stored energy. The browner, bigger hydra I’ve encountered is probably Hydra oligactis. This species characteristically has tentacles about an inch (25.4 mm) long. How do Hydra arrive in our tanks? That is a matter of debate. Some people like to think that Hydra come with brine shrimp eggs. 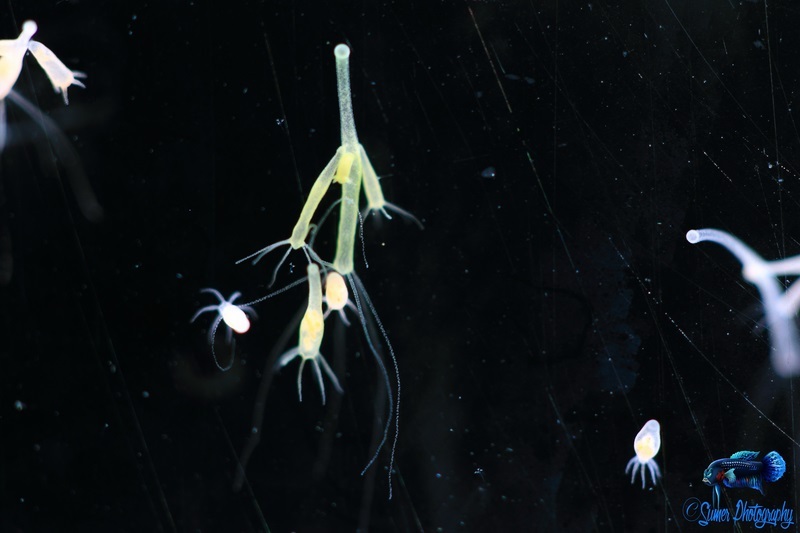 Others disagree, noting that Hydra is a freshwater animal and brine shrimp eggs are collected and hatched in saltwater; hence, there couldn’t be a connection between brine shrimp eggs and Hydra. Some people claim that they come from your normal tap water (highly unlikely with typical municipal water treatment systems). Others argue that, even if RO water is used, Hydra can appear in your tank, and so there is no correlation between tap water and the appearance of Hydra. The most likely sources are probably untreated water from nature or a rainbarrel. Any water brought in with live foods collected in the wild (e.g. 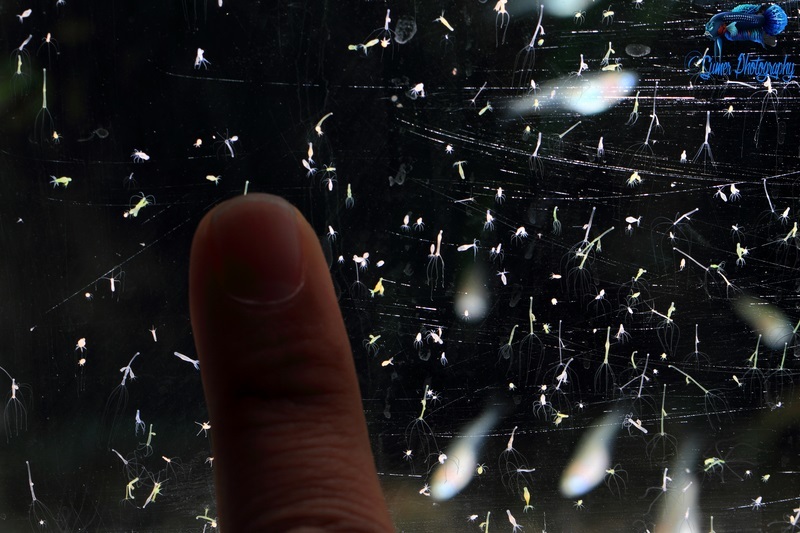 Daphnia) is a very likely source of invasive Hydra spp. Aquarium plants may be how most Hydra species hitch their way into an aquarium. No matter how they enter a tank, Hydra get in and become a pain. Hydra tend to congregate at locations where food sources, such as baby brine shrimp, are added to the aquarium. 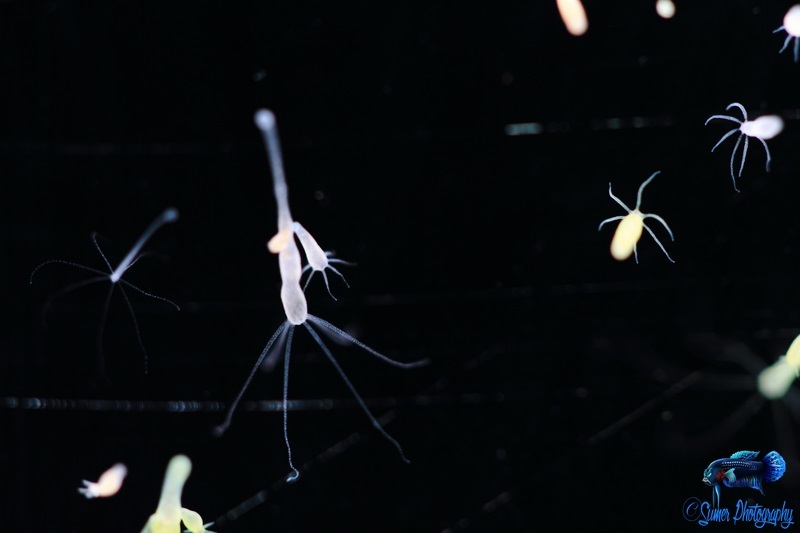 While Hydra appear to be intelligent, soon congregating where the brine shrimp are most abundant, in reality, they are simply following the abundance gradients of the brine shrimp (or other food sources) in the tank. 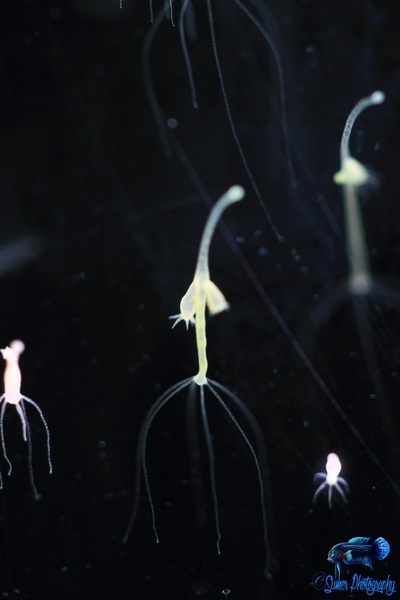 Hydra will gradually move to where the concentration of the brine shrimp is greatest. How do Hydra attack? As mentioned earlier, Hydra are related to jellyfish. 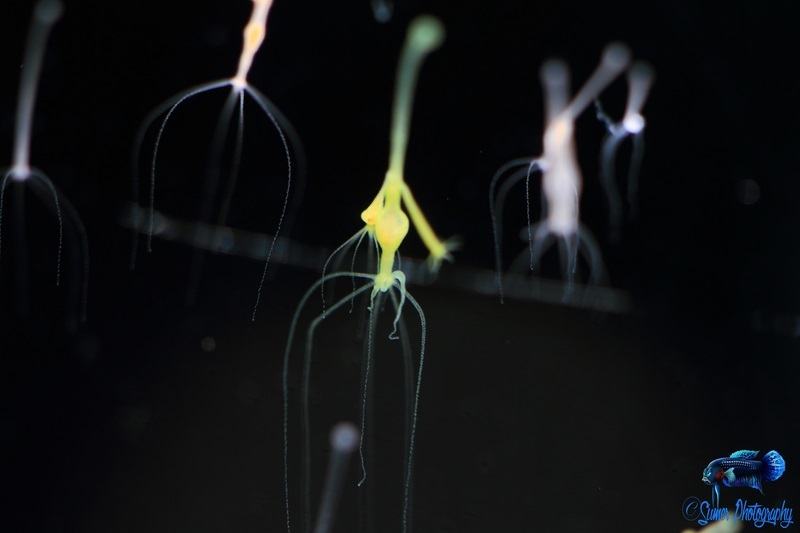 Some scientists even propose that Hydra represent an early evolutionary stage of jellyfish; at minimum, modern views suggest that Jellyfish (aka Sea Jellies) and Hydra might share a common ancestoral origin. A Hydra’s body is covered with very small, stiff hairs that act like triggers. Each hair connects to a specialized cell called a nematocyte, which contains a complex secreted capsule called a nematocyst. This nematocyst capsule contains a string-like structure and neurotoxins. In simplified terms, when a prey item contacts the hair, it triggers a mechanism where the nematocyst contents are projected at a very high speed into the prey’s body. This sudden injection of neurotoxins paralyzes the prey. This is exactly how a jellyfish kills and captures its prey. Individual hydra can use separate tentacles to attack a different individual prey. Some writers describe Hydra as having supernatural powers. Some cite research that has led some scientists to conclude that Hydra are “biologically immortal.” They don’t appear to age (senesce), but as invertebrate zoologist Dr. Ronald Shimek notes, “It is unclear if that is a fact or an artifact of how [the hydra] have been observed.” Some researchers are trying to find out why Hydra don’t seem to age, given the long-term hope of how this might reduce or eliminate human aging. Still, if you cut Hydra in pieces, each piece can become a new Hydra! Isn’t that a superpower? Tremendous reproductive potential combined with readily available food sources can quickly lead to hydra infestations of plague proportions. Okay, cloning themselves every time they’re cut in half may not really make them superpowerful, but it speaks to the awesome reproductive potential and resilience of Hydra. They can reproduce in two ways: sexually and asexually. When Hydra have plenty of food to eat, they may reproduce asexually, meaning that only one individual Hydra is necessary to make Hydra babies. Each individual does this by budding. On the mature hydra’s body, a bud will start growing. It becomes a baby Hydra and then falls off the mature Hydra’s body. In optimal conditions, they can put out a new Hydra every second day. When the water conditions become foul, or they start to starve, Hydra may reproduce sexually. The males secrete sperm in the water column for other Hydra to pick up later. The eggs are then fertilized and later released to hatch when environmental conditions become more favorable. Some Hydra species are even known to be hermaphrodites! What can be done to eradicate Hydra from a tank? Since precaution is better than a cure, let’s talk about how you can prevent them from infesting your tank. Don’t overfeed your fry tank. I know how easy it is to get carried away, but please suppress that motherly feeling and feed only what they can eat in 10 minutes or so. If you are overfeeding with baby brine shrimp and Hydra are introduced into the tank, within a week they can cover all the walls, bottom, and even the water surface of your tank (if there is not much surface agitation). If you stop feeding baby brine shrimp, it takes a week or so for Hydra to wither away. The ones that are on the bottom of the surface can also eat Microworms and Grindal Worms. Some fish, like Guppies and gouramis, have been known to eat Hydra. Usually, introducing these fish is not an option because you don’t want to risk life of your fry. Gouramis or Guppies can very easily gobble down fry of other fish also. Hobbyists also use chemicals like fenbendazole and flubendazole to eradicate Hydra. These chemicals are known to be fish-safe, but they kill snails. Since I am always very wary about using chemicals that can kill things, I try to stay away from them. Hydrogen peroxide (H2O2) is an oxidizing agent and is often used to kill bacteria on a cut or wound. When applied, the enzymes present in cells act as a catalyst and H2O2 starts breaking into water and oxygen atoms, which badly need second electrons (their oxidation state is -1). Each of these nascent oxygens is very reactive and can take an electron from molecules in the bacterial cell wall. With the electrons being stolen, the cell wall gets damaged and the bacterium dies. This is also how hydrogen peroxide bleaches hair and cloth. We can use this property to kill Hydra. I take a syringe with a blunt needle (available online for a few bucks), fill it with H2O2 solution, and then put H2O2 on the Hydra (see video below). You can see them wither away almost immediately. It might take another dose to kill them completely. The more the contact time between H2O2 and the Hydra’s cells, the more damage it will do. The only downside of this method is that you have to be careful not to squirt it directly onto fry. You have to do this to each Hydra, one by one. If your tank is lightly infested, it works great. But if your tank is heavily infested, it might be better to empty the tank and clean it. Right after shooting H2O2 onto a Hydra, you will start seeing some bubbles of pure oxygen rising from the hydra’s body, which can be a satisfying sight for any tank owner. It can take 24-30 hours for H2O2 to break down in the water in the absence of a catalyst. However, 10 ml of 3% H2O2 solution in 5 gallons of water would become .0015% concentration H2O2, negligible enough to not do any harm in any way. Still, I always perform a water change after killing Hydra with hydrogen peroxide. Another method to remove Hydra involves emptying the tank and washing it with potassium permanganate (also a strong oxidizing agent). This will get rid of all the snails, Hydra, etc. You can also dip all the hardscape that’s in the tank, including plants. Wash everything with freshwater multiple times before using it again. Potassium permanganate is both very caustic and fatal if ingested. Be sure to read up on this material before using it in any aquarium. No matter what I did in my tanks, the Hydra invaders seemed to return. I’ve found it’s very difficult to keep Hydra at bay in the tanks where you are feeding baby brine shrimps three times a day. However, it is possible to keep infestations at bay using some of the techniques I mentioned here. At this point, if I have got you thinking that Hydra are of no use, do a Google search with “buy hydra culture.” Many websites sell them at a current price of $10 per culture. They are, it turns out, classic animals for teaching biology and experimenting with populations of predators that can regenerate themselves. This might make you want to stop working with fish and start culturing only Hydra! After reading a lot about Hydra and seeing them in my tanks, I have started to appreciate their special abilities. However, since they harm my fry and steal their food, we remain foes. Try a couple of Asolene spixi snails, they will often eat hydra and any leftover food. Panacur, a puppy and kitten wormer (in SUSPENSION form i.e. in a bottle), kills all Hydra within hours. It is harmless to fish, fry and eggs. Work out your own dosage using information provided with the treatment. First you write this – Since I am always very wary about using chemicals that can kill things, I try to stay away from them. In the very next paragraph you go on to describe in great detail how to use H2O2 – a chemical – to kill hydra !!! !